The Government of the Virgin Islands has received a donation of $100,000.00 toward the Territory’s rebuilding and recovery efforts. 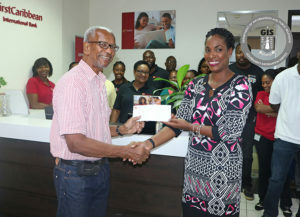 Premier and Minister of Finance, Dr. the Honourable D. Orlando Smith, OBE was presented with the cheque on Tuesday, October 3 from Country Manager for CIBC First Caribbean International, Ms. Stephanie Burke. Ms. Burke explained that coming out of Hurricane Irma, CIBC First Caribbean International looked at the level of devastation across the region and has donated $550,000 across the region to those countries that were affected. She further explained the British Virgin Islands was in a great position to benefit with $100,000.00 of the donation towards efforts in the areas of education, environment and wellness. In his remarks, Premier Smith expressed the Government’s gratitude and noted that the Territory has undergone three substantial events in the past several weeks, namely the floods of August 7 and 8, then Hurricane Irma and followed by Hurricane Maria. The Honourable Premier reiterated the importance of banks in the whole recovery effort, and thanked CIBC First Caribbean International, along with all of the Territory’s banks for reopening as quickly as possible so that commerce could continue. The Territory’s leader said the Government will be looking to the United Kingdom for assistance because of the relationship that has always been there, especially in terms of aid and grants. He noted that both British Foreign Secretary Mr. Boris Johnson, and the Secretary of State for the Department for International Development, the Right Honourable Priti Patel, Member of Parliament, visited and saw first-hand, the level of devastation in the BVI and they have promised that the British Government will assist. The Government of the Virgin Islands is committed to the restoration and rebuilding of the BVI as an ideal place to live, work, visit and do business.